Source One has teamed up with the Institute for Supply Management (ISM) as a Diamond Sponsor for their upcoming annual conference, ISM2016, taking place in Indianapolis from May 15th -18th. The conference offers a unique opportunity to network and collaborate with more than 2,500 procurement and global supply chain professionals. The conference features keynote speakers, Alan Mulally, former President and CEO of Ford Motor Company, and Susan Cain, author of the bestselling book: The Power of Introverts in a World That Can’t Stop Talking. Continuing our Countdown to ISM2016 Podcast Series, this week Project Analysts Brian Seipel and Nicole Mahaffey team up to take a look at the reasons why suppliers aren't responding to your RFP. Despite your best efforts to develop a comprehensive RFP to fully assess suppliers' capabilities, there can be a few red flags that can send a supplier running from your RFP. 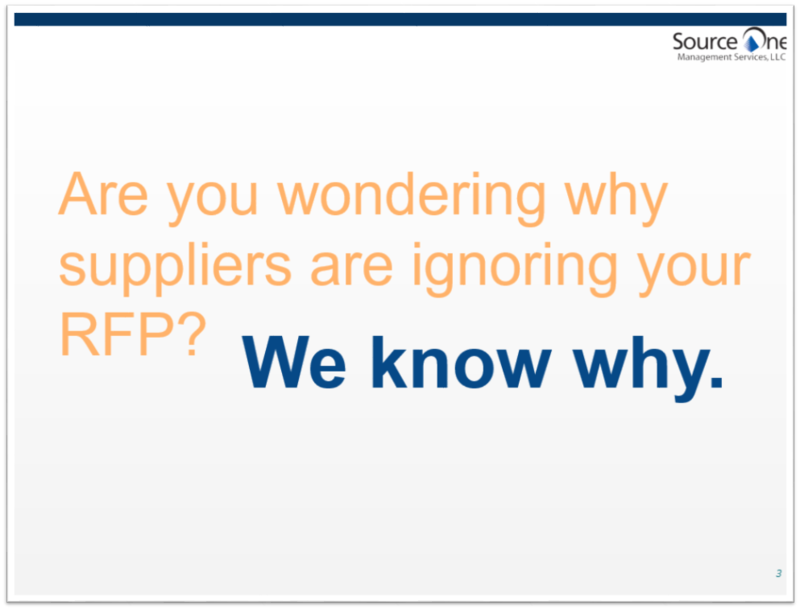 Mahaffey and Seipel explain these fatal flaws within your RFP and the steps to take to ensure suppliers stay engaged throughout your cost-reduction initiative. 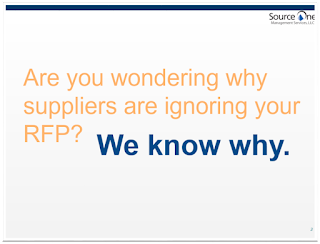 Have questions regarding RFP responses, negotiating contracts, or managing your supplier relationship? Source One has you covered. Contact us today to learn how our cost-reduction experts can give your bottom line a boost.